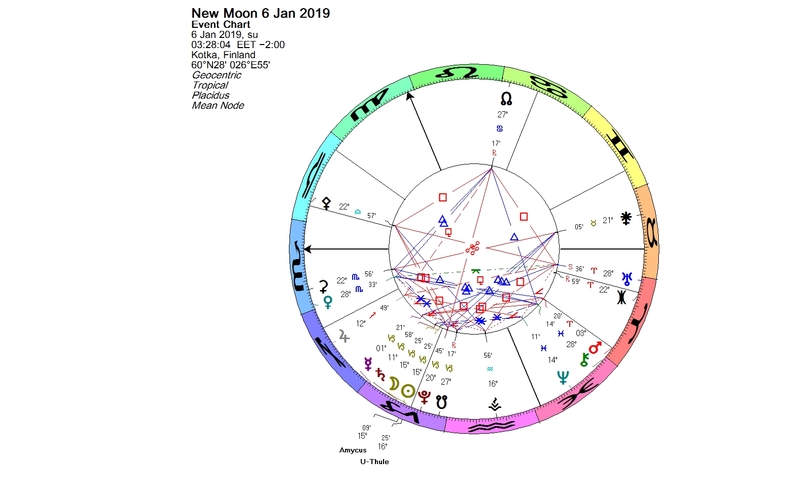 The New Moon at 15+ degrees Capricorn on Jan. 6, 2019, is the first eclipse of the year, a partial solar eclipse in Capricorn. The Sun and the Moon are in conjunction with Saturn, the ruler of Capricorn. Exactly at the eclipse degree is 55576 Amycus, a small centaur discovered in 2002 and given the name in 2005. At the next degree (16+ Capricorn) is Ultima Thule, the most distant world ever visited by a man-made spacecraft. Uranus is stationary direct in late degrees of Aries. Ultima Thule is a nickname for 2014 MU69, a distant cubewano, which was targeted for the space probe New Horizons’ next destination after it would have completed a flyby of Pluto, which happened in 2015. The name means a place beyond the borders of the known world. On Jan. 1, 2019, New Horizons spacecraft made a close pass of Ultima Thule. The photos it sent to Earth revealed, that Ultima Thule is a contact binary, consisting of two separate bodies joined together. The larger one is now called Ultima and the smaller one Thule. This binary is a primitive object, which is going to help scientists learn important things about the origins of our solar system. 55576 Amycus was named after a centaur, which had an important role in the Centauromachy, a famous myth telling about a battle between the Lapith people and the centaurs in Greek mythology. The centaurs were a bunch of troublemakers (except Chiron and Pholus), and Amycus was a member of his tribe. The aforementioned battle took place during the wedding of the king of the Lapiths, Pirithous, and his bride Hippodameia. Amycus was responsible for the first death of one of the Lapiths. Amycus was killed, the centaurs were defeated, and those who kept their lives were forced to flee from Thessaly. As human beings we have an ability to choose our actions. What we do, whether good or bad, affects other people. Also we are members of our tribe, namely humankind. It is difficult to be a truly human all by oneself. Society gives human beings their humanity. I think that the astrological meaning of Amycus has a great deal to do with this connectedness and with the choices we make, including their consequences. This entry was posted on Sunday, January 6th, 2019 at 2:50 am	and is filed under Eclipses, New Moon. You can follow any responses to this entry through the RSS 2.0 feed. You can leave a response, or trackback from your own site.